Each month there will be 4 posts ranging in topics. If I stop my registration and start again at a later date will I have access to the older videos? Once you stop your registration you will lose access to the videos when your subscription ends. If you decide to start again you will receive videos from 30 days before your second sign up date. Should I sign up for PRIVY if I haven’t taken a course? PRIVY was created for the professional who has taken at least one PRI course, and is interested in continuing to learn more about PRI concepts. The more PRI courses one has attended, the more they will get out of the video content posted to PRIVY. There will be a mix of Primary and Secondary course content, along with many other topics. How do I get email notifications for new posts? Under each post there is an “Add a comment…” button. 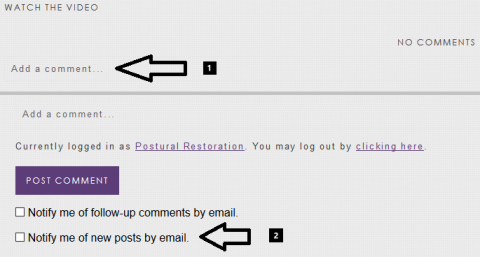 Click this and it will expand and you will have the choice of being updated of any comments on that post or getting email notifications for each new post we make. Can I submit topics for consideration for future videos? Absolutely! We encourage the submission of questions, due to the amount of questions we receive we can’t guarantee that we will be able to answer them all but we will try our best. Contact Us with your ideas! Can I have access to all the videos if I sign up at a later time? You have access to all of the videos that were published 30 days before you signed up. We will be releasing new content weekly. If you decide to sign up at a later time and you would like access to all the videos you can give us a phone call to pay for all the previous months and they can be added to your account.